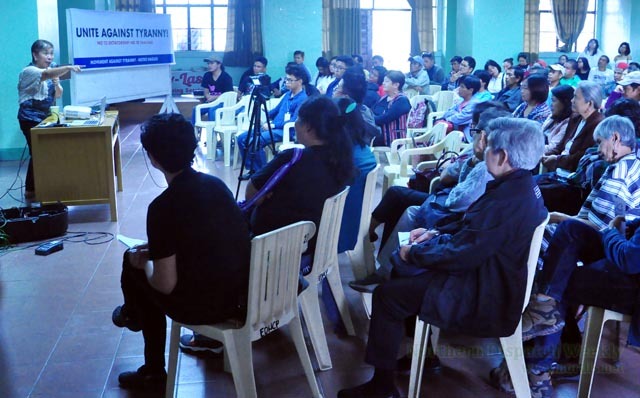 The activities of the 23rd began with a forum organized by the Movement Against Tyranny (MAT) – Metro Baguio about the current national situation and lessons from the struggles during Martial Law. Addressing the audience from all over the Cordilleras was veteran journalist and MAT National Convenor Inday Espina-Varona. She talked about the tyranny of the current Duterte regime. She scored Duterte on failing on his promise on land reform, irrigation and other services. She added on ENDO and contractualization, the bombing of Lumad schools. She also outlined the failed promises on the education sector – on both teachers’ salaries and students’ tuition and other school fees. Also a topic was the militarization of indigenous communities to give way to mining and energy corporations. “On human rights, we can expect nothing from him. Since Day 1, he has complete neglect of human rights,” she said. “It is not only a creeping tyranny or an unraveling democracy but a full-blown dictatorship. She cites the 13,000 casualty war on drugs, the destruction of Marawi and Martial Law in Mindanao , the crackdown against activists among others as examples of how Duterte’s cling to power results to the oppression and damage of people’s rights, both individual and collective. She further warns about the use of the Charter Change (ChaCha) to galvanize his rule. It is considered as a rubber stamp to legitimize what Duterte wants for the nation, and it is, to briefly say, to be subservient to foreign interests as one of the ChaCha’s provisions is 100 percent foreign ownership. So she called on the audience to unite across all sectors and fight in all forms to upset Duterte’s plans of a dictatorial rule. She also reiterated to make more friends and not antagonize the present Duterte supporters so we can build the greatest unity possible. 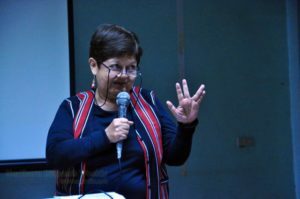 Meanwhile, Cordillera Peoples Alliance Advisory Council Member Joanna Cariño talked about the Martial Law era when she, as a young activist, joined with other youth and connected their struggles with the struggles of the Cordilleras and the nation. She remembered the Chico Dam and Cellophil project protests and how unities in the ili quickly spread throughout the region and how the indigenous peoples of Kalinga, Mountain Province and Abra found themselves fighting against a dictatorship in order to keep their ancestral domain for themselves and their children. The program ended with a challenge to the audience to launch all forms of struggle against Duterte’s dictatorship. The audience also signed a manifesto of unity against Charter Change. Afterwards, the audience converged with two other mass-ups for a protest at Baguio’s Session Road. Students for St. Louis University, University of the Philippines-Baguio, University of the Cordilleras and Benguet State University were present. They were against the Tax Reform for Acceleration and Inclusion (TRAIN) Law, the Jeepney Phaseout, the Charter Change, the “bogus” Free Tuition Law among others. Also in attendance were delegates from Tongtongan Ti Umili, Movement Against Tyranny, Let’s Organize for Democracy and Integrity (LODI) and the women human rights defenders who were slapped trumped-up charges.